We’d love your help. Let us know what’s wrong with this preview of Body of Work by Christine Montross. Christine Montross was a nervous first-year medical student, standing outside the anatomy lab on her first day of class, preparing herself for what was to come. Entering a room with stainless-steel tables topped by corpses in body bags is shocking no matter how long you've prepared yourself, but a strange thing happened when Montross met her cadaver. Instead of being disgusted by her, she was utterly intrigued-intrigued by the person the woman once was, humbled by the sacrifice she had made in donating her body to science, fascinated by the strange, unsettling beauty of the human form. They called her Eve. This is the story of Montross and Eve-the student and the subject-and the surprising relationship that grew between them. Body of Work is a mesmerizing, rarely seen glimpse into the day-to-day life of a medical student-yet one that follows naturally in the footsteps of recent highly successful literary renderings of the mysteries of medicine such as Atul Gawande's Complications: A Surgeon's Notes on an Imperfect Science. Christine Montross was a poet long before she became a doctor and brings an uncommon perspective to the emotional difficulty of the first year of medical school-the dispiriting task of remaining clinical and detached while in the anatomy lab and the struggle with the line you've crossed by violating another's body once you leave it. To ask other readers questions about Body of Work, please sign up. A fascinating account of this "acceptable taboo" subject - namely, the medical dissection of the human body by medical students. This one is up close and personal, because the author is one of the students. She takes us through the entire semester - or more precisely the spiritual journey she undergoes. We follow Ms. Montross through her development - both human and medical. She is obviously anguished by what she has to do in the medical lab - and her reactions and exposé give the bo Fascinating! Like all medical students she must learn to balance feelings and discomfort when listening to patients - but not at the loss of giving just a cold clinical diagnosis. We also get a sense of the mental and physical stress that these students undergo - not all of them make it through the entire term. They are in their own special club - and those outside the club cannot properly relate to them. Ms. Montross gives us wonderful insights into this club. Another aspect of the book I liked was its lack of criticisms. This is not a book that rails against the medical profession and those in it. It treats all from the body undergoing dissection to the students, doctors and patients with a great deal of humanism and respect. She also gives a history of anatomical dissection and how bodies were acquired (more often stolen) in past eras. Given the subject this is not easy reading - it is necessarily morbid. I did not have nightmares, but the words in the book remain with you - as does any good book. I read this book as one of four required readings for my Medical Reading section of HOSA competition this year, and I am so grateful that I did. This is a memoir that takes place during a first year medical student's experiences in her anatomy class dissecting a cadaver. The writing is fluid and easily transitions between the writer's time in the lab and hospital and medical history involving the evolution of dissection. I was amazed and entranced by this book, and found myself palpating my neck I read this book as one of four required readings for my Medical Reading section of HOSA competition this year, and I am so grateful that I did. This is a memoir that takes place during a first year medical student's experiences in her anatomy class dissecting a cadaver. The writing is fluid and easily transitions between the writer's time in the lab and hospital and medical history involving the evolution of dissection. I was amazed and entranced by this book, and found myself palpating my neck for my sternocleidomastoid as the author describes locating it on herself while finding it in her cadaver. A great memoir about a very sensitive subject, and from a sensitive person. As a doctor and a cardiac surgeon this book touched me deeply. I felt like i have written it myself with all these feelings and thoughts. In the anatomy lab we dissect cadavers as we should do, but more importantly we dissect our lives, our bodies, our existence. This memoir is very personal, deeply personal and existential that it touches every reader. I will read it again and again, as you should Instantly became a favorite. "To visualize the valves' function, Lex and I decide to take a heart to the sink and pour water through the pulmonary trunk toward the ventricle. THe semilunar valves work like a dream, catching the water as sails catch wind, closing fast and preventing any leakage. It is astonishing, almost impossible to believe." I don't know, I found it less than almost impossible to believe, but maybe that's why I'm at the University of Toledo Medical School and not Brown. If you're interested in how the body works and you want a sort of coming of age story combined then this book is great. I did enjoy reading it, but I was disappointed by all the exaggeration when I finally started doing dissections of my own. Extremely eloquent, sobering while at the same time comforting. Anything more I could say would only detract from Montross's gorgeous prose. 5 stars. Montross does the impossible: she puts the indescribable into words and gives a lucid, tender, heartfelt account of the inexpressible. It is a perfectly balanced juxtaposition of body and emotion, of human form and human spirit. I admit to being somewhat reluctant to review this book, as if to do so is to finally let go of the experience of reading it, much like writing the epitaph of a loved one might mean another step in letting go of the fact of a life. This is one of those rare reads that got into my marrow and changed (at least for a time, if not forever) my way of thinking about things; not merely mortality and the relationship of my physical being to that slippery concept of what constitutes a "self", but much de I admit to being somewhat reluctant to review this book, as if to do so is to finally let go of the experience of reading it, much like writing the epitaph of a loved one might mean another step in letting go of the fact of a life. This is one of those rare reads that got into my marrow and changed (at least for a time, if not forever) my way of thinking about things; not merely mortality and the relationship of my physical being to that slippery concept of what constitutes a "self", but much deeper truths. For among the many questions raised by Body of Work is this: what part of what I consider to be me is contained in my body? Most of us intellectual, Western, post-Freudian types have thoroughly absorbed the dictum that whatever may be the essence of who we are is contained in the mind, which is in the brain, which is in the head, and there's an end to it. When the brain is dead, our identities are no longer contained in this hunk of muscle, bone, and guts. Either the "soul" dies out completely or continues on in some ephemeral form, but it has entirely flown this body. This is what we, most of us, have concluded from the evidence at hand. As a former ICU nurse, I have had the privilege to be present at the death of many people, have seen them move from the state of animation to disanimation, from living to most clearly dead. I have felt the body go from warm to cool, and the eyes from live coals to empty sockets. As a clinician, with no true emotional stake in this person's living or dying, why was I always moved by this experience? Why was there a feeling almost of holiness (I can find no better word) at being present there? More recently, I was at the bedside of my cousin when he was declared brain dead and let go. But how many of these have I actually seen die? Many, including my cousin, lost all brain function long before I ever saw them, but their bodies were still ticking along, automatically (or, more accurately, autonomically): breathing, heart beating, hands and faces and feet moving spasmodically. At what point were they no longer alive? Christine Montross was, to our good fortune, a writer long before she decided to return to school to become a physician. As part of that training, she had to pass through the proving ground of the gross anatomy lab, where she was required to dissect a human body. Eve, the name she and her partners give her (mysteriously, she had no navel, thus her name came to her naturally) has clearly been dead for some time, but is well-preserved. Nonetheless, there is no life in her. She is the wrong color, is cold, and looks distinctly dead. Why, then, is Montross so reluctant to cut and saw and prod and pry into this lifeless slab of a former human? Why would we all recoil at such a violation? Why, for that matter, don't we just put Granny on the curb for pick-up with the garbage and compost? What do we have invested in the sanctity of the human body, and why? Why do we have such elaborate funerary rites with open caskets and flowers and prayers? It is worth observing that when gesturing to ourselves, we do not point to our heads but to our hearts, and when we feel something deeply, we feel it in our "guts". Buddhist cosmology is quite clear that the beingness of an individual is carried throughout the body and not merely in our heads. Even in that culture, though bodies were (and are) sometimes left in the open to rot or to be consumed by carrion, this is done with great ritual and with honor to them as great teachers. While still alive, the Buddha said that all things could be learned from "this fathom-long body". How is this suddenly untrue when we die? This is the journey on which this book takes us. From the first cut to the last, the author wonders what the nature of her fear is, her reluctance and revulsion, wonders how she can so desecrate a body yet, for the sake of being a good physician, how she can refuse. Eve is a person to her, as she would be to most of us, I suspect. Montross intersperses these reflections with her investigation into the history of human dissection, and a rather checkered past it is, with governments declaring that certain miscreants will be further defiled by being donated for this purpose and grave-robbing being a not-uncommon method for acquiring subjects. The Catholic church, extremely powerful in Europe in the heyday of anatomical research and vociferously opposed to the practice, plays a huge part in this history. But Eve is the star, and Montross's relationship to her as she is dismantling her the focus of this superb book. We find ourselves drawn into her world with our own questions and fears and qualms. Gently but inexorably, she shines a light on our bodies and our cherishing of them in a way that leaves us moved and shaken, yet feeling more than ever a sense of the glory of our own being, of the mystery of that being, of how unfathomable the connection between what is flesh and what is, purely and finally, us. Another book that made me contemplate my decision not to pursue my dreams of attending medical school. This book was very similar to the last book I read about the Human Anatomy Lab, 'First Cut'. In fact, as I read, my mind decided the two books were 2 different perspectives of the same class. It was many books ago that I read 'First Cut', so I didn't remember the precise details of that book, but in the back of my mind, I recall a 'fat man' who was replaced midway through the semester due to de Another book that made me contemplate my decision not to pursue my dreams of attending medical school. This book was very similar to the last book I read about the Human Anatomy Lab, 'First Cut'. In fact, as I read, my mind decided the two books were 2 different perspectives of the same class. It was many books ago that I read 'First Cut', so I didn't remember the precise details of that book, but in the back of my mind, I recall a 'fat man' who was replaced midway through the semester due to decomposition as well as a group whose cadaver was lacking a navel. It was the latter cadaver who was the feature of 'Body of Work', because while the author of 'First Cut' was an observer writing a book, this author was one of the students doing the dissection, and her observations are made knowing that this is her future. Like the authors of every other med school book I have read, Montross was not a fresh-out-of-undergrad naive student when she embarked on the medical school journey. I think having experiences beyond 16+ consecutive years of schooling in her immediate history is what makes this book good. Montross already has a stable romantic relationship, a past work experience, and the opportunity to make the most of her medical school experience by travelling to the places where the value of dissection were first contemplated. What I also liked about this book was that while it followed the semester chronologically as they explored the body, Montross includes anecdotes from her past and present, outside of her medical career, and also stories of her experience during later stages of her education where she needed to apply knowledge and emotions first conquered in the anatomy lab. Kind of a mixed book for me. The author makes a binary distinction between the reactions of students to the anatomy lab; I definitely did not fall into the same category, and occasionally was annoyed by Montross's insistent language making her reactions seem like the "proper" ones to have. Growing up with a family that openly talked about human dissection at the dinner table (mom's an anatomy teacher) likely already prepared me emotionally for the dissections. The examination of the history of an Kind of a mixed book for me. The author makes a binary distinction between the reactions of students to the anatomy lab; I definitely did not fall into the same category, and occasionally was annoyed by Montross's insistent language making her reactions seem like the "proper" ones to have. Growing up with a family that openly talked about human dissection at the dinner table (mom's an anatomy teacher) likely already prepared me emotionally for the dissections. The examination of the history of anatomy study is what saved the book from the tossing pile for me. Nice to see that Montross did her research. That being said, I'm curious to know what dissection manual her school used. I was stunned when the instructor said that they would be removing the heart on the first day in the anatomy lab, mainly due to the work involved with getting to that point from a new body combined with the students' inexperience in dissection and the fine structures that could easily be destroyed by a slip of the scissors. And the method described for removing the lungs seemed unnecessarily dangerous to the students, but these thoughts are more personal than critical of the book. Documenting the rite of passage for all medical students in the anatomy lab...dissection of a human cadaver. Throw in a little history of dissection, some medical terminology, a great narrator, and some emotional anecdotes; allow to soak in as needed and you have a recipe for a good read (or listen)! This hit home for me. A favorite . Not very grotesque at all. More insightful on the journey of a first year of medical school in the anatomy lab that all doctors have endured. A very emotional , and interesting experience for those who have been through it, and for those who have not, the book will give you appreciation for those who have seen death in front of them. Interesting but at times somewhat dry due to all the medical terms, etc. - but I would recommend this book to anyone that has an interest in medicine, anatomy, or the history of same. I like it but it took me a while to get through it - reading a bit at a time. Poetic, thoughtful, and, at times, a little bit gross - a view of the rigors of anatomy class combined with meditations on death, love, the history of medicine, what it means to be human, and what it means to become a physician. Really well-done, although not a book to read while eating. First year medical student's "meditations on mortality from the human anatomy lab." The book was very good but I find it very interesting that there was not one mention of God or intelligent design. This book was fabulously written - and throughout my reading of it, I found myself wanting to know more about the lives of the cadavers, much the way the students likely would have during their studies. If death, medicine, or anatomy are not subjects one is interested in, I doubt this book would be chosen at all, but just the same it is a tribute to subjects we humans tend to shy away from. The details, which some may find extensive and gruesome, were incredibly well handled with a level of resp This book was fabulously written - and throughout my reading of it, I found myself wanting to know more about the lives of the cadavers, much the way the students likely would have during their studies. If death, medicine, or anatomy are not subjects one is interested in, I doubt this book would be chosen at all, but just the same it is a tribute to subjects we humans tend to shy away from. The details, which some may find extensive and gruesome, were incredibly well handled with a level of respect that is difficult to master. The author's research into medical and anatomical history and origins of her subject were well painted and I found myself seeking more visual examples of her topics. She painted quite a picture with words alone, but a photo of the same thing brought it all together. I found that I couldn't read this book with any level of distraction, it was so in depth and required much mental focus to thoroughly enjoy. In addition I wanted to be as present as possible to feel as if I had been an observer to her journey, both in the lab and out. Being an avid library book user, I rarely purchase books, but this one made its way to my bookshelf, complete with notes and page markings. This was SO darned good. Montross is a sensitive writer with beautiful prose. She takes us through her experiences dissecting the body of an old woman who she and her medical student colleagues name “Eve”. This is the centerpiece for her reflections on the human condition. Grief, fear, pain, love. I bought this at a used book sale and noticed that I coincidentally ha e another of hers as well. I’m jumping in that one. Brought me back to my A&P days as a nursing student at UVM, where we were privileged to have a human cadaver to learn along with. A difficult and emotional journey, Montross does a wonderful job of letting us into her personal experience as a med student. I especially liked the historical references she provided. Beautiful dissertation on mortality as seen through the eyes of a medical student. Her rumination is far and wide. The process of dissection, while macabre for many, serves a beautiful purpose here. Excellent read on many levels. For me, this book was perfect and hit a perfect time. Much longer review later., but the writing was fluid and lovely. The themes and musings on our relationships to death hit on the same line as thoughts I have been having lately. I love medical history and medical nonfiction and memoirs, and this was one of the best I have read. Ok, longer review. This book both cemented my fascination with wanting to go to medical school or some further medical training, and also cemented the fact that I coul For me, this book was perfect and hit a perfect time. Much longer review later., but the writing was fluid and lovely. The themes and musings on our relationships to death hit on the same line as thoughts I have been having lately. I love medical history and medical nonfiction and memoirs, and this was one of the best I have read. Ok, longer review. This book both cemented my fascination with wanting to go to medical school or some further medical training, and also cemented the fact that I could never handle medical school. Not necessarily because of the gross anatomy cadaver dissection lab, but despite my love of medicine, anatomy, science, and knowledge, I think it's just too grueling. However, it also drove home a point that I wish I had known a few years ago. I did half of a two year surgical tech program(operating room assistant) before dropping out for v various reasons. One of the reasons I chose that program was that I knew it was hard. One of the biggest reasons I had for leaving the program was the feeling that I had no idea what I was doing, and wasn't really getting taught that. Apparently, all medical students feel the same way, only some are made aware of these feelings through their instructors and peers and can talk about it, and others are just made to feel that it's all you and in your head. This knowledge or having had more open discussion about it might have changed my mind. She discusses a paper she read about detached concern and death anxiety among first year medical students in relation to their experiences in the cadaver lab, and how that course helps create the insider/outsider mentality and emotional strength needed to practice medicine. "It is unacceptable to fail; it is unacceptable to be weak. Admission of either makes one seem unfit for the lofty charge...And thus in the realm of the superhuman there is no room for human frailty, and admission of it by one risks revealing the illusion of the many. So no one speaks up, and as a result each person believes that she is alone in her experience. " "The second thing I tell her is that I am stunned by how roughly the body is treated during surgery, how the intestines were pulled out of the body and shoved back in, then mashed on one side, literally tucked tightly into the body beneath a towel and held back by huge metal clamps. I tell her that it is not at all the way one would intuitively treat a living body." This is something I felt and witnessed during my time in the OR. The taught us about how to depersonalize, and yet at the same time how much care needs to be take to not have someone's arm turned the wrong way for a few hours to prevent a pinched nerve. Medicine is full of large contradictions. Lately I've been thinking a lot about people's relationships to and feelings surrounding death, and this book had a lot of musings on that as well. One of the things I was most dreading and looking forward to was near the end of the book/course when the author and lab partners would have to finally reveal the cadavers face and finish their dissection. As much as you want to compartmentalize, seeing a face of someone that could be your grandmother and brings life into this thing you have densensized yourself to for months is challenging and through provoking. I found it fascinating when she talked about how many medical students have nightmares throughout their semester in the cadaver lab. The final takeaway I got from this book was that I almost definitely want to donate my body to science when I die. I even read about the requirements of some of the local medical schools. There are many ways your donation can be used, and I would be happy to do something for science and academia. IN CHRISTINE MONTROSS BODY OF WORK, Christine Montross is a first year medical student at Warren Alpert Medical School. When she first arrived there was a briefcase that had her name on it. She had to bring the bones home. She finds that she was taller that he. She finds that they both have the same sized feet. She learns “that the most alarming moments of anatomy are the bizarre, the unknown. They are the familiar” (Montross 13). The first day in the anatomy lab she was partnered with four other; Tripler (Trip), Tamara, and Raj. Their cadaver is a female. They first do the dissection of the thorax, or the chest cavity. They dissect the lungs and heart first learning the chambers and rotation of blood throughout the body. One night Trip and Christine are studying and they go to the lab. Once they are there, they decide to take the tape off the face. They discover that their cadaver is very beautiful something that they did not expect could be possible for the dead. Once the thoracic dissection was done they were ready to begin the arm dissection. In order to do continue with the dissection they had to turn over their cadavers. When they flip their cadaver back over onto its backside and remove the cloth over its abdomen, they discover that she does not have a belly button. This leads to naming her “Eve”. When they have finished their full dissection of Eve, she is prepared for cremation. This is when Christine is struck with the realization of how much Eve has given her unknowingly. Christine writes, “Great teacher, I give you flowers. I carry your body to the funeral pyre. When you burn, may ever space in you that I have named flare and burst into light” (Montross 292). Christine Montross's book, Body of Work, was very intriguing and interesting. I love learning about the human body and how it works because it always amazes me that so much goes on inside of me and I don’t even register it. It is always mind-blowing to me that my brain can multitask with so many things at one time. I will use many of the life lessons from the book in my day to day life. An example of this is that everyone I see I find something distinctive about them that is so beautiful. I cannot judge someone by their looks just because they look different because we are the same on the inside. What I learned effects that world because of the judging that is toward dead bodies. Many people are afraid of them because they are cold and unresponsive. But really, they are all the same just different on the outside. 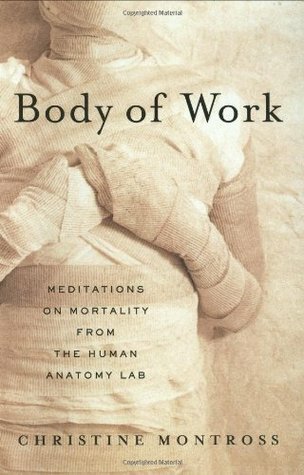 I would recommend this book, Body of Work by Christine Montross, to those who are intrigued by the workings of the body. I found it very interesting to learn the true names of parts of the body that are known very well by another name. Body of Work by Christine Montross is very interesting and informative on the subject of the human body. You begin to learn to heal the living by dismantling the dead. It will hardly be noticed, I discover, as I walk down the [street]...carrying two-thirds of a human skeleton in my briefcase. The most alarming moments of anatomy are not the bizarre, the unknown. They are the familiar. 17th century travel diaries & postcards reveal that attending a dissection was a society event & marked a European traveler as on the progressive edge of culture. In early anatomy-education times, some medical colleges would even accept all or a portion of a student’s tuition in the form of cadavers. You enter the medical profession like anyone else, and then within the first week, 3 things happen that differentiate you from everyone else you know. You touch & cut dead bodies. You are able to ask private and socially inappropriate questions of people, and they answer you. And you can suddenly walk into a hospital room, ask someone to take off his clothes, and he will do it. Within the first week of starting school, I am suddenly fielding phone calls about hysterectomy options and back pain and ear infections. Unless any of my loved ones has a pressing question about how to find their angle of Louis...I’m of no help. Most nights in the dream space between wakefulness and sleep, I am skinning people. I will nod in the direction of humor, of absurdity, but I will stop myself before I cross the line into disrespect. How does one go about purchasing a man in one-inch increments? As it turns out, the answer is that you send a cadaver and $22,000 to a guy named Davy in Kentucky, who will embed the body in plastic and then cut it into slices with a band saw. What one cannot quite comprehend, in the end, is that no matter what is done to the body, it has absolutely no effect on the person who once inhabited it. The horror is not what is present and cut apart but what has so completely and irreversibly gone. The utilitarian perspective of resource allocation and odds is a luxury afforded to someone who does not love the body lying in the hospital bed with oddly flexed arms. And did you get what you wanted from this live, even so? And from the moment when anatomical knowledge begins to take on that quality of the innately known – at some unidentifiable point midway through the semester – the foundation is laid for an understanding of disease...in this way our dismantling of the body gives birth to our ability to make the sick and broken body whole. Body of Work is one of the best novels I have ever read, and one of my all-time favorite memoirs—as well as my personal bit of evidence that I am not, nor will I ever be, cut out for a career in medicine. Christine Montross, now a psychiatrist working at Butler Hospital in Rhode Island, wrote this memoir of her trials and tribulations in medical school, and her graphic descriptions of medical practices are written in a beautifully poetic and intimate manner. She was a poetry professor before she Body of Work is one of the best novels I have ever read, and one of my all-time favorite memoirs—as well as my personal bit of evidence that I am not, nor will I ever be, cut out for a career in medicine. Christine Montross, now a psychiatrist working at Butler Hospital in Rhode Island, wrote this memoir of her trials and tribulations in medical school, and her graphic descriptions of medical practices are written in a beautifully poetic and intimate manner. She was a poetry professor before she decided to become a doctor, and it shows. Her literary voice reveals a warm and compassionate nature, and Montross’s personal journey involves coming to terms with death and attaining balance between professional detachment and empathy towards patients. In particular, Body of Work deals with Montross learning to dissect human corpses for study, namely the corpse that she and her classmates are assigned, who they call Eve. In her mind, Eve becomes her friend and personal guide, and she holds Eve’s hand while a classmate cuts into her with a scalpel, wanting to comfort her through the pain she does not feel. In fact, Montross dedicates this book to Eve, who she credits with helping her become a good doctor. Her devotion to Eve is remarkably, almost achingly moving, and her philosophical musings of life, death and the nature of human relationships are at once viscerally familiar and universally relatable. Montross also proves to be an exceptional storyteller, as she writes of the history of corpse dissection as medical practice; of eras such as the 18th century, when students could only work with corpses of executed prisoners; of medical students who resorted to robbing graves when governments wouldn’t provide specimens. There’s also the intriguing story of Burke and Hare, serial murderers in 19th century Scotland who sold corpses of their victims to a medical professor. Also fascinating is her research on how the practice currently varies among different cultures; for example, medical students in India regard their specimens as sacred, and they carry out group prayers and ceremonies for them before the dissections. Christine Montross is Assistant Professor of Psychiatry and Human Behaviour at Brown University and a practising inpatient psychiatrist with an MFA in poetry. Her writing has appeared in literary journals and women’s magazines as well as the New York Times. She lives in Providence, Rhode Island.